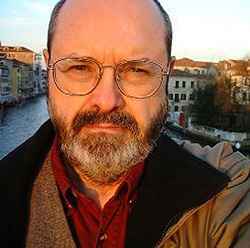 Phill Niblock was born October 2, 1933, in Anderson, Indiana, and gained a degree in Economics before turning to photography and film in 1960. He shot portraits of many leading personalities in New York's jazz and avant-garde art circles in the early 1960s, ranging from Duke Ellington and Sun Ra to John Cage and Yoko Ono. Inspired by Morton Feldman's pieces containing extremely drawn-out notes, as well as by other music, he began to make music himself, and became part of the scene around the Sonic Arts Union (Gordon Mumma, Alvin Lucier, and others). Since the early 1970s, he runs the non-commercial Experimental Intermedia organisation, which still arranges concerts in his Centre Street loft in New York City.